Wordless Wednesday: This is Your Milk. This is Your Milk on Grass. Today’s post came to me this morning while I was milking Bonnie, our Jersey cow, and watching the golden milk froth into the pail. 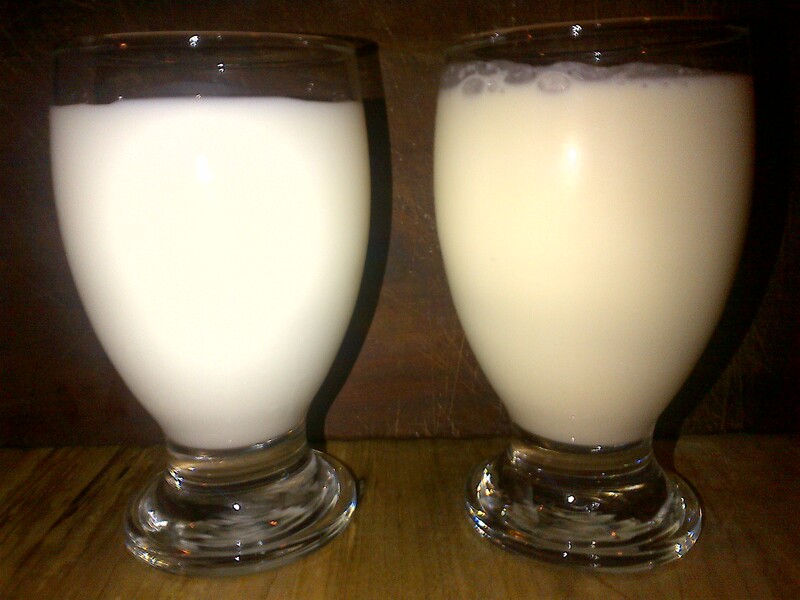 The difference in colour between these two glasses of milk can probably be partially attributed to a difference in butterfat (the store-bought milk is 2% and our own is probably testing around 5%), but there’s also good evidence to point to higher levels of beta-carotene, omega-3s, and CLAs in organic milk – primarily due to the forage-based diet of organic cows. 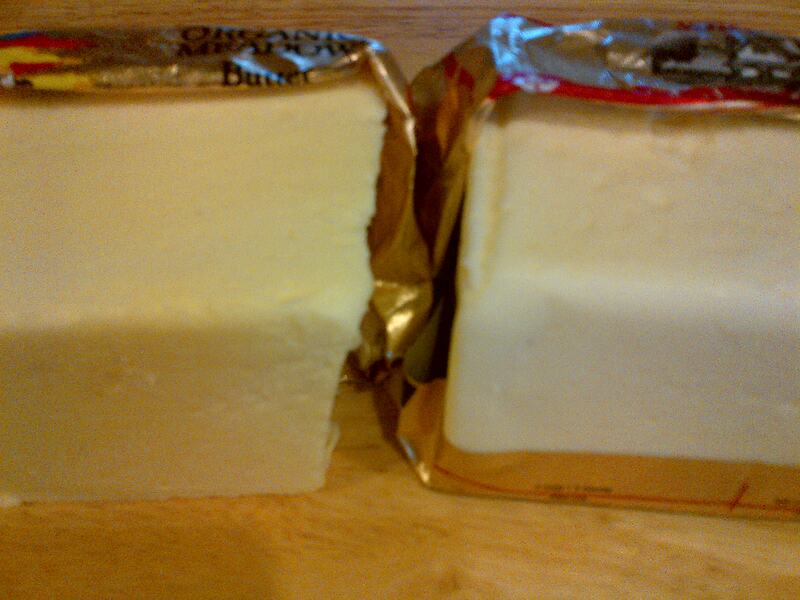 This difference can also be seen by comparing regular butter to organic butter, as shown in the photo below. As for the taste? Head to your nearest store and try for yourself! Nothing reads better than a photo. Thanks for sharing. I have done taste comparisons to organic butter and regular butter (using European- 86% milkfat, not sweet cream) and didn’t notice an appreciable difference in taste. Thanks for the comment. My comparison is based on regular Canadian butter from the supermarket – I’m sure the European product is quite different yet again! With European butters, there’s typically a higher milkfat content (82 to 85 percent for most brands). They have less moisture than standard butter in the US/Canada and they are typically not sweet cream butters. Instead, they’re made from fermented (aka “cultured”) cream. Maybe a science fair project for some young person? Is there a major difference between the diets of organic verse conventional dairy cattle in winter? I assume Bonnie is not eating grass at this time of year. Great idea, Richard! My guess (partially educated by the research (and milk) I’ve seen) is that all of the grass-fed milks are going to look pretty similar, with more yellow in the Jersey milks, because the differences are diet-related. During the winter, organic dairy cows are still required to consume a diet that is at least 60% forage (by dry weight), and at least a quarter of that has to be long-fiber forage (greater than 10cm). In practice, the actual percentage will vary from 60% to 100% on organic farms, and there are conventional farms that would fall into this same range, too. As for Bonnie, we’ve dried her off for the winter and are expecting her to calve this spring. She’s eating primarily dry hay, but during the extreme cold spells we’ve had this winter, I’ve been feeding the cows some oats to be sure they’re meeting their energy requirements. The point to keep in mind, I believe, is that although some conventional farms will employ some “organic” practices (high-forage/pasture-based rations in this case), consumers who want to access these specific products have limited options – although there are some “grass-fed” labels in certain parts of North America, in most cases, they need to look for the organic label.